Kids begin playing with water as soon as they can sit up to take a bath. They learn that water flows into and out of containers, escapes through even the tiniest hole or crack in a container, can be hot, cold, or lukewarm, “wets” some objects and not others, and has many other physical properties. Water (not ice) is a fluid. To the scientist, a fluid is a gas, a liquid, or a granular solid (like sand or granular sugar) that has the ability to flow. Exploring “flows” is what makes the bathtub and sandbox such a playground for kids. Observing “flows” is a great activity for helping kids learn how to observe (and not just look at) events in the natural world. In the following video, two drops of blue food coloring sitting at the bottom of a layer of cooking oil, coalesce into a single drop and then burst into a bottle containing ordinary water. The pattern that follows is reproducible. View the video and then help the kids to set up the same apparatus. I never tire of watching fluid phenomena. Each one is different but still the same. To make your own Color Burst gather these materials. • wait patiently for the food coloring to burst through the oil into the water. 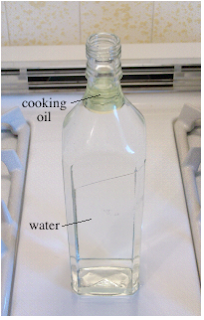 To repeat the process, draw off the cooking oil with an eyedropper and refresh the water. 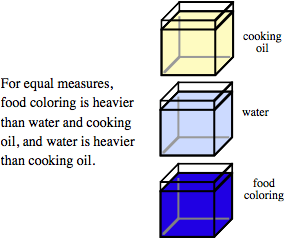 The drop of food coloring being heavier than cooking oil, sinks to the bottom of the layer of oil. 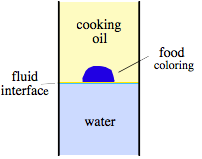 The boundary that separates the oil from the water is called the fluid interface. There are forces at the interface that prevent the drop of food coloring from immediately breaking through into the water. The heavier food coloring eventually wedges its way through the interface into the water. Notice that the drop of food coloring does not just fall through the interface, it bursts through! Be sure the kids note the structure of the ensuing flow of food coloring through the water. Even though mixing occurs, thin tendrils of food coloring end in circular pads that are characteristic and appear whenever the process is repeated. Over time, I will share numerous activities that use water play as an effective way to introduce kids to some very important concepts in science. In Color Burst, three fluids with different densities interact in a simple but dramatic way to illustrate an important fluid concept called Rayleigh-Taylor Instability. (Don’t let the name scare you as Rayleigh and Taylor were two pioneers in the field of fluid dynamics.) More about Rayleigh-Taylor Instability in later posts.